Many patients are discovering the benefits of dental veneers. 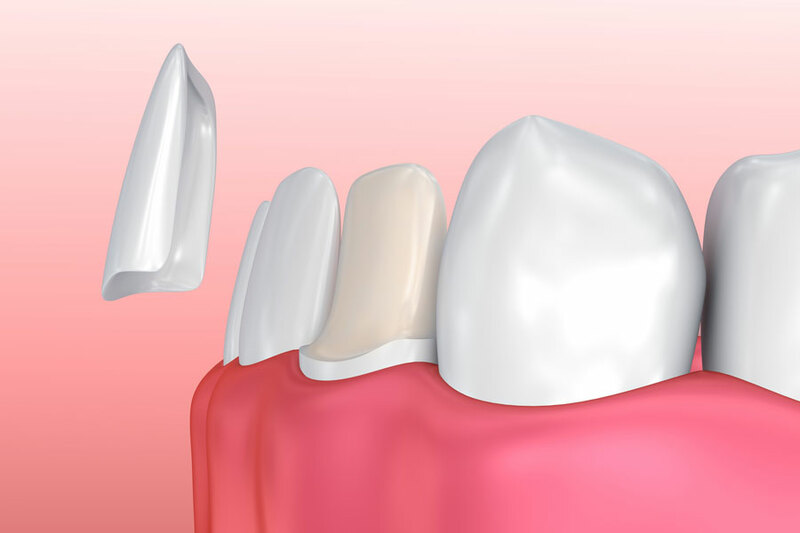 Unlike a dental crown which covers the entire tooth, dental veneer is a thin covering that is placed over the front (visible) part of the tooth. Dental Veneers are a popular treatment option for several reasons. They generally are placed on upper front teeth that are severely discolored, poorly shaped or slightly crooked. Veneers may be used to lighten front that are naturally yellow or have a grey cast and cannot be whitened by bleaching. Veneers are sometimes used to correct teeth that are chipped or worn. They also may be used to correct uneven spaces or a diastema (a large, noticeable gap between the upper front teeth). Preparations for veneers are always dictated by three dimensional steps on how the final restoration is to be placed within the shape of the patient’s face, mouth, lips, and the entire gingiva. This is finalized by a smile design with patient inputs and requirements and to be personally verified based on use. There are two types of dental veneers: resin-based composite veneers and ceramic veneers (sometimes called laminates). Resin-based composite veneers generally are placed in one appointment. After the tooth is prepared or reshaped, the dentist carefully bonds and sculpts the composite material in a color that matches your other teeth. A special light is used to harden the composite. The veneer is smoothed and polished to look like a natural tooth. Ceramic veneers are extremely thin shells made of a strong and durable dental ceramic. The dentist removes a small amount of enamel from the front and sides of the tooth. This makes room for the veneer and prevents the restored tooth from feeling or looking bulky or unnatural. Next, the dentist makes an impression of the prepared teeth so that the shape of the preparations and surrounding teeth can be replicated in the dental laboratory. The dentist also looks for the shade that will best match or blend with the other teeth. The impressions are sent to a dental laboratory that makes the ceramic veneers to fit your individual teeth. At the next visit, the dentist places the veneers on the teeth to check the fit and shape. After any adjustments, the teeth are cleaned and the ceramic veneers are bonded to the teeth with dental cement. Further adjustments may be done at a subsequent appointment. Teeth must be healthy and free of decay and active periodontal disease. Veneers typically require less removal of tooth enamel than crowns. Patients who clench or grind their teeth are not good candidates for veneers because the thin veneers may chip, break or peel. Avoid biting your fingernails and chewing on hard objects such as pencils or ice. Like any dental restoration, veneers can be dislodged over time and with wear. In that case, new ones might be needed. No special maintenance is needed after having dental veneers other than good oral hygiene each day. Brush twice a day with fluoride toothpaste and clean between your teeth once a day with floss or another interdental cleaner. Q: What are the advantages of veneers? A: Veneers make teeth look natural and healthy, and because they are very thin and are held in place by a special strong bond (rather like superglue) very little preparation of the tooth is necessary. A: Veneers can improve the color, shape, and position of teeth. A precise shade of porcelain can be chosen to give the required color, to improve a single discolored or stained tooth, or to lighten front teeth (usually the upper ones) generally. Veneers can also be used to close small gaps or, if one tooth is slightly out of position, a veneer can sometimes be fitted to bring it into line with the others if orthodontics is not acceptable. A: Natural colored filling material can be used for minor repairs to front teeth. This type of restoration is excellent where the tooth supports the filling, but may not work so well for broken tooth corners. There will always be a join between the tooth and the filling material. Crowns are used for teeth which need to be strengthened – whether because they have broken, have been weakened by a very large filling, have had root canal treatment, or the patient grinds their teeth. Q: How long will veneers last? A: Veneers should last for many years, but they can chip or break, just as your own teeth can. Small chips can be repaired, or a new veneer fitted if necessary. They may not be suitable for people who grind their teeth excessively. A: Some of the shiny outer enamel surface of the tooth may be removed, to ensure that the veneer will not feel ‘bulky’ to the lips when it is bonded permanently in place. The amount of enamel to be removed is minimal and will be the same as the thickness of the veneer to be fitted, so that the tooth remains the same size. Once the tooth has been prepared, the dentist will take an impression. This will be given to our highly skilled technician along with any other information needed to make the veneer. The color of the surrounding teeth is carefully recorded and matched on a shade guide to make sure that the veneer will look entirely natural. A: A veneer takes at least two visits. The first is to prepare the tooth and to match the shade, and the second one is to fit it. Bonding a veneer in place is done with a special adhesive, which holds it firmly on the tooth. A: Because the preparation of the tooth is minimal, you will probably not need a temporary veneer. The tooth will look very much the same after preparation, but will feel slightly less smooth.